Yeah, I got some sweet matchboxes. Slantback, ftw. Aircooled volkswagens are the only volkswagens. Hey, I Got Some Stuff. The hunt has been strong with me since I was a little dude. I’ve been absent, mostly due to housing issues, but the .99 remains strong with this one. I finally found my favorite car, ever, period, the McLaren F1. This counts as a scale car, right? Or build yet own poo-basket out of polystyrene dremel remnants and the purest of love. Sorry for the randomness; I’m trying to get back on here and what better way than with some sweet 1:1(ish) action. 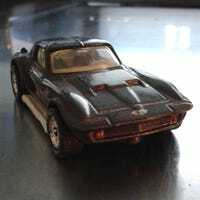 Well, joy of joys, i found this 1/24 elan in the rite aid across the street from me, where they are usually broken or just so warm on the shelf that there may be a hip-hop song about them. so i did these three little guys, and i’m pretty okay with how they turned out considering they’re hand-painted. also, 211 is my official racing number, because 40oz’s. the inside looks like a jackson pollack painting. das hahaha boot! mans, i was quite happy to see this little dude on the pegs. it is definitely a step up from, say, the bat, but that was awesome too so what the blue butts am i on about? cigarette in mouth; " you were made fer this." see, i’ve been hunting now about 30 years, and i personally find it violence-inspiring to see some tub-chunk balding subhuman paraquat checking out with all of the stuff. i wanted to sneak-shadow this Crabby Upward Ridiculous Tyrant out to his car and de-card his happy little s-hit. there's always time for little cars. Since my divorce and subsequent realignment with what it means to live somewhere, i have nonetheless aquired a few hw and the odd mbx. some may find this to their liking. I was wandering around and found this guy. I figured I’d dig these out, now that I know what they are. So, I like to take all my junk out and re-organize it here and there. Nationality, color, etc. This is a 1/39 pull-back Benz I keep in my cat’s toybox because it really goes. ...to blow on tiny cars at the time. Well, it can't be all that bad Wednesday. Hello again. I return to share what are, upon review, my less than stellar tiny-car-centric pictures from that crucible of ferrous oxide and truly advanced electrical practices, Italy.